Santa's sack is full of toys in this delightful candy holder. This delightful vintage container was produced in 1983. The beautifully trimmed heavy paper die cut of Santa with his sack hides a sturdy hard red plastic container - the perfect gift wrap when you have no time to wrap! 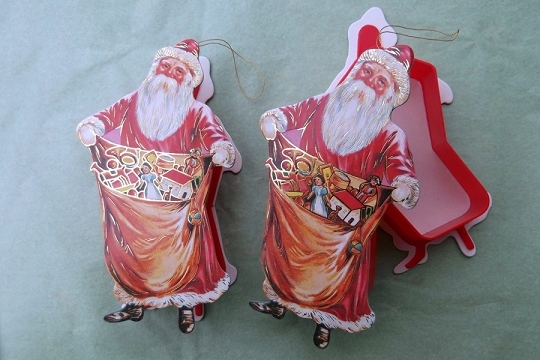 Santa is nicely die cut and features golden embossed accents. He can hang from a golden thread on your tree. He will also stand nicely on a table. The box lid fits snugly, so you don't have to worry about the contents falling out. The entire piece measures 6-7/8 inches tall by 3-3/4 inches wide. The box itself is a bit smaller at 4-5/8 inches at the tallest by 2-1/2 inches at the widest and 1-1/4 inch deep. The box is shaped to fit behind Santa, so it is not a rectangle as you would expect. This makes it so much more special. We're showing two containers so that you can see them closed and open. This box is no longer produced, so it is very hard to find.